If there’s anyone still signed up to this please come over to my NEW PAGE where my blogging continues in earnest. This blog was barely touched and a bit sporadic. My new blog has already been more active in the last week than this one. It’s been silent on here for a while. I thought I had better things to focus on. Perhaps I did. It’s been a long time and I’m sure I’ve achieved things between then and now; I’ve been published as a model, I’ve appeared in a short film, yet I feel like I’m just skimming the surface of something greater. Sitting here, after a job rejection, I’ve come to the conclusion that the only achievement I really want is to write, and be published. Job security, academic gain, all of that is nothing. I need to write. If anything can validate my time on earth it’s that. And you know what? Good. I’ve dallied on the edge off bohemian life for far too long. I want to be a writer yet I barely write. All the drive I had at the beginning has trailed off, so it’s time to get back on track. This is the kick I need to get back into it as though my life depended on it. Not that I’ll refuse a job offer should it come up, but there’s never going to be a perfect time to write – I’ve been waiting for a mythical sense of financial security that may never come. I’ve done a huge amount of reading, I’m talking a book a day here! I need to be a part of that. I need to spin tales and put them down in words. For me writing is a lot like exercise: the more working out you do the more working out you’re capable of doing. So this is what this blog will be about. Me writing about writing, purely for writing’s sake (God I’ve written writing a lot). Whenever I hit a wall I’ll come here and write about it, and you can read about it, if you like. It won’t be Gilgamesh, but it’ll be mine, and that’s good enough. For now. In the meantime I plan to order two books, both by friends of mine. I’ve been meaning to for so long it seems. Walled by David Owain Hughes. And Suncaller, by B John Shaw Liddle. For those of you that have followed this blog thus far (that’s right I’m on about you three!) you would have noticed that despite my ‘One review a week’ aim, things have been very quite for a while now. Let me explain myself. Writing, or rather writing regularly and objectively, always makes me feel good. What with University just around the corner (again! :D) it was good for me to get into the writing mood again. The reviews were a great medium to write creatively about things that mattered to me. After my last review I had a number of ideas about albums to review. But then something amazing happened. I started to write prose. As soon as I got back from work every day I would write until I couldn’t stay awake. And you know what? I’m still writing. I’ve tried to write novels before (who hasn’t right?) but after about three thousand words I’d get bored with the concept, the characters, everything. I’d forget about it all completely. Then I stumbled across something I had started to write about a year ago, I read it with fresh eyes so to speak, it was pretty damn good. So I carried it on. I revived the characters, the plot. I designed the world with more detail and I got stuck in. I have never felt this way about writing before. It’s like a story is clawing its way out of me. Half the time I don’t even think about what I’m writing. I sit down and let my mind wander and before I know it plot arcs are forming, characters are developing, all seemingly without me thinking about it. It’s a weird feeling. The words are flowing from my mind without any trouble whatsoever. And as it stands I’m nearing 50,000 words and it’s all happened in a fairly short amount of time. I’m aiming for 100,000 as a general goal but at this rate and with how much there is left to tell I imagine I’ll go over that amount. I’m not saying that what I’m writing is perfect, it may amount to nothing in the end. But I can’t stop writing. There’s a whole world created, a whole set of people, an adventure, that exists now in words that would never have been there without me. In a rather twisted way it all relies on me to exist. To create a world, a whole reality, to have everything that happens there as your responsibility, it feels so exhilarating! I have started talking to publishers, getting advice from published authors, and I even have artists ready to start working on the cover art and the world map (all good fantasy stories need world maps! ), I don’t know where this will take me, but I feel good about it. It feels ‘right’. That is my reason for neglecting this blog. I will try to sneak the occasional review in occasionally though! But enough about me. I made this blog site with the aim of reviewing music so here’s a few music related things so that this post isn’t all about me! First up, Take-That. I’m not fussed on them. Never have been. But one of their newer songs, and the video to this song, has been a pleasant surprise. It’s visually quite Steampunk, or at least some of the outfits are. This caused some outrage from the Steampunk community which I don’t think is fair. The song is really quite good, the video is entertaining, and the Steampunk outfits look good, rather than looking like a parody. This isn’t mainstream Steampunk, it was just an inspired off-the-cuff idea from one of the video directors that fitted the message of the song! And it works. Which is more than Panic at the Disco can say about their foray into the genre. See? That wasn’t so bad was it? 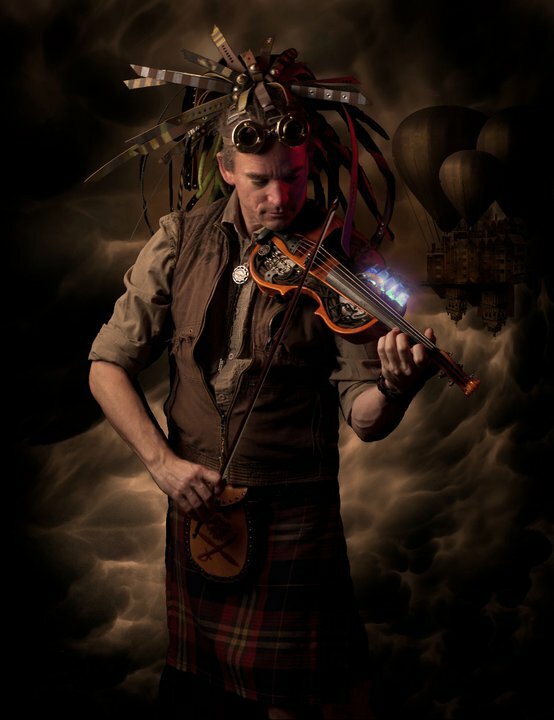 Anyone expecting Gary Barlow (yes I had to google the member’s names) to turn up at a Steampunk convention? No, because the video was just a bit of fun. 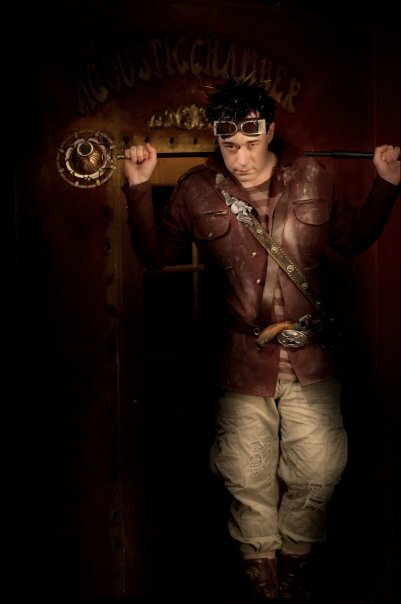 And fun, coupled with creativity is what Steampunk is all about right? Next up, Lady Gaga. I have avoided her this long simply because the music seemed to be going over the same ground that pop stars have been star jumping on for a while now. I gave one of her new songs a chance due to its name: ‘Judas’. I find religion incredibly interesting, as most atheists do I’m sure. So I was interested to see if the video and the song matched the name. And it really did. It was basically about a love triangle between Mary Magdalene, Jesus, and Judas. But looked at in a wider scope what it came across as was the human desire to embrace both the ‘good’ and ‘evil’ parts that make us human. In the video these three biblical characters and the disciples were a biker gang of sorts. It may sound lame but it works! After seeing this I checked out some of her other songs and got bored very quickly. But this song is still brilliant in my opinion. Okay, I hope you’ve enjoyed this little foray into my mind and into the more mainstream music area. Sure these songs need no publicity but I found them interesting discussion points when it comes to style genre’s and biblical teachings. You’re own opinions are your own and my opinions are mine. Make of it what you will. As a music reviewer it is important to keep a certain degree of distance between you and the music you are reviewing, objectivity is the key and without it all a review becomes is a fan boy/girl rant. 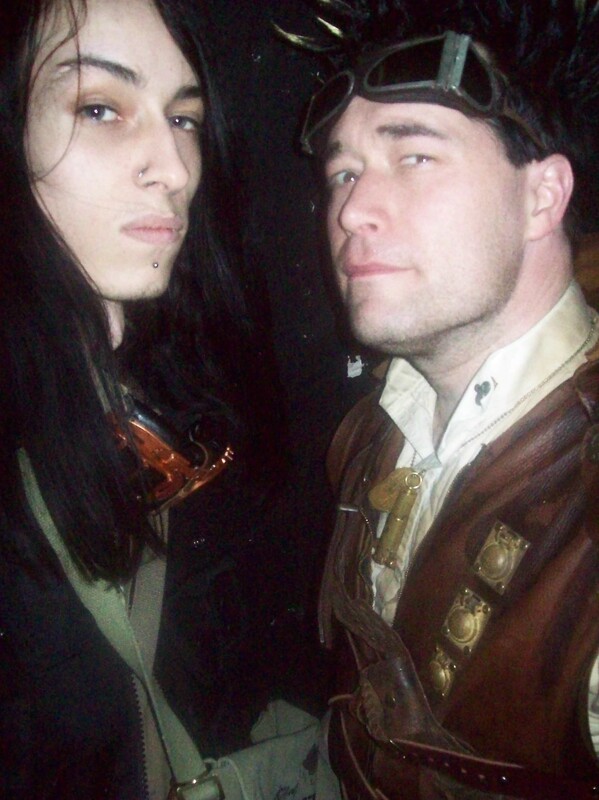 It is for that reason that I have never reviewed any album by Abney Park. It would end up being a 10,000 word essay on how bloody amazingly awesome cool they are (yes: ‘awesome cool’). It would be so flattering no-one would believe it and so long that even fans would get bored with reading it… and the band may take out restraining orders on me… even if they are an ocean away. 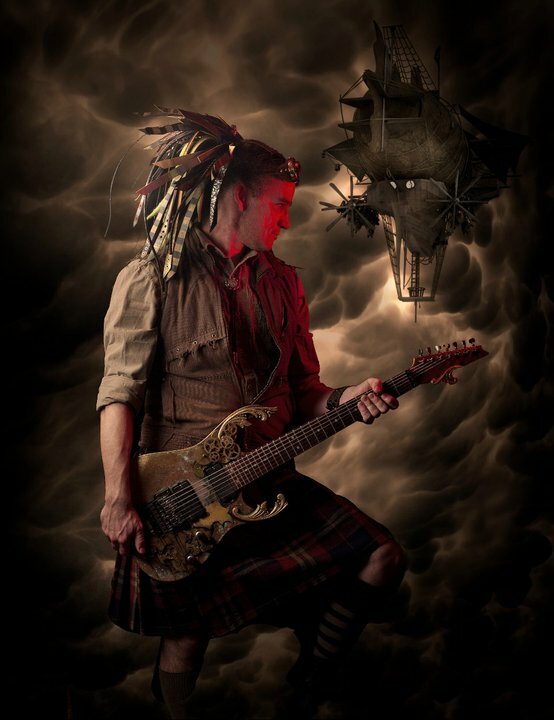 The members of Abney Park have altered slightly over the years and although each deserves a mention I felt it made more sense to use only pictures of the current line up to avoid confusion. So, in the picture above, from left to right: Nathaniel Johnstone, Jody Ellen, Captain Robert, Kristina Erickson and Daniel Cederman. Captain Robert: The band’s front man and undisputed leader (they don’t call him the captain for nothing!). 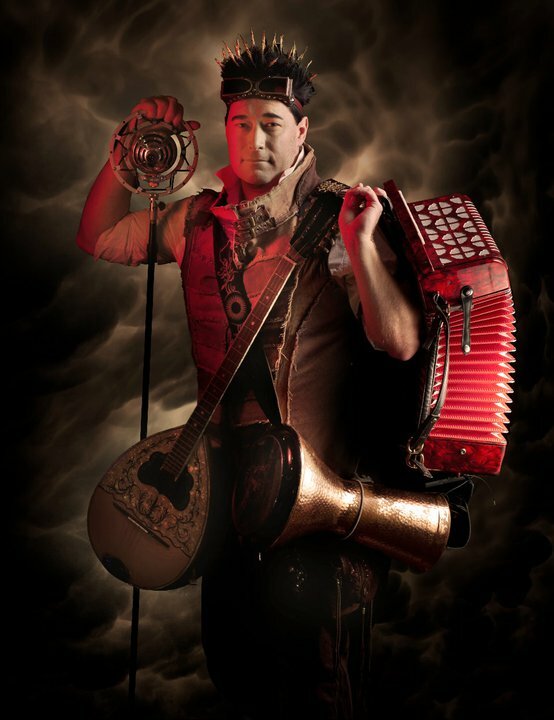 Besides lead vocals he also plays: Darbuka, Diatonic button accordion, harmonica, bouzouki, bağlama and ukulele! 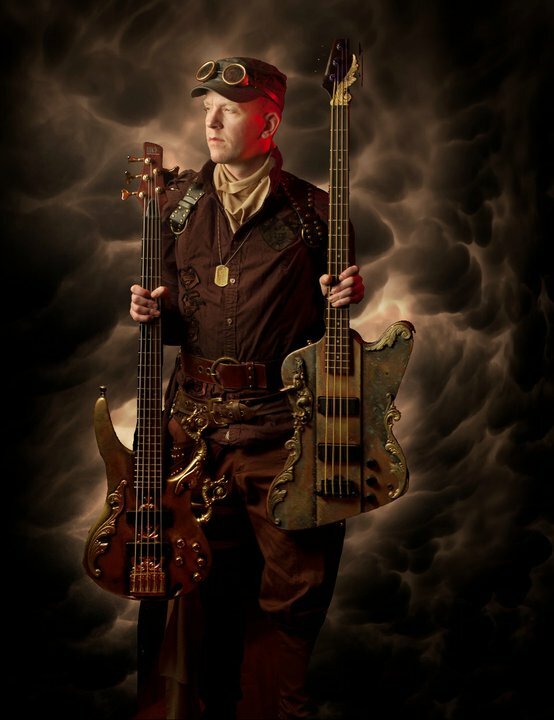 Daniel Cederman: Master of the Flintlock Bass and damn nifty on the acoustic guitar Daniel brings the firepower! Kristina Erickson: With her keyboard and piano prowess Kristina provides the band with the atmosphere that has made them what they are. 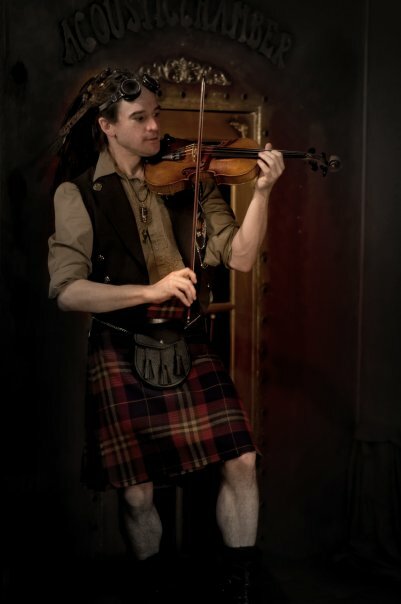 Nathaniel Johnstone: Guitar, violin, mandolin, banjo… Nathaniel seems to have mastered them all… switching between them all during songs can prove difficult however! Fortunately there are always fans willing to lend a hand! Jody Ellen: Vocals also, but by no means backing; Jody brings a new level of vocal diversity to the crew! 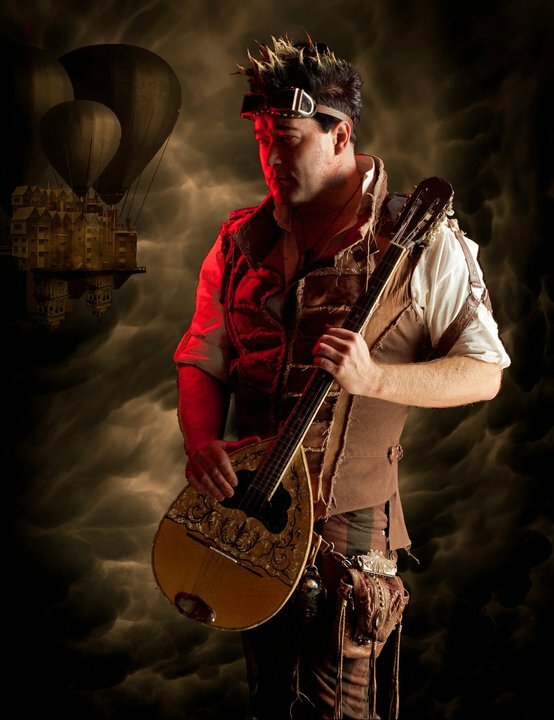 Out of all the Steampunk bands and stories created, none seem so complete as that which Abney Park have created around themselves…. Their attention to detail, both with their instruments as well as their outfits is astounding. These are people who Live their music. It really is their world. And it shows. And all the work they’ve put in is greatly appreciated; their fan base grows on a daily basis. 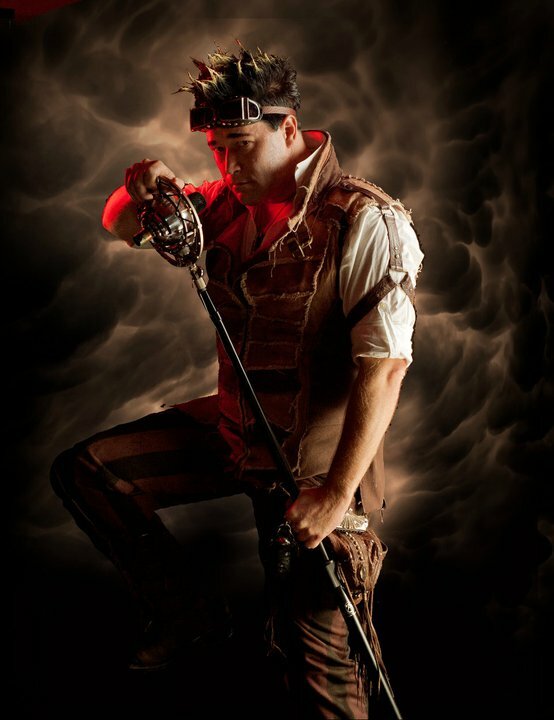 There are very few in the Steampunk community who don’t know of them. And don’t go thinking their instruments and clothes are shop bought! 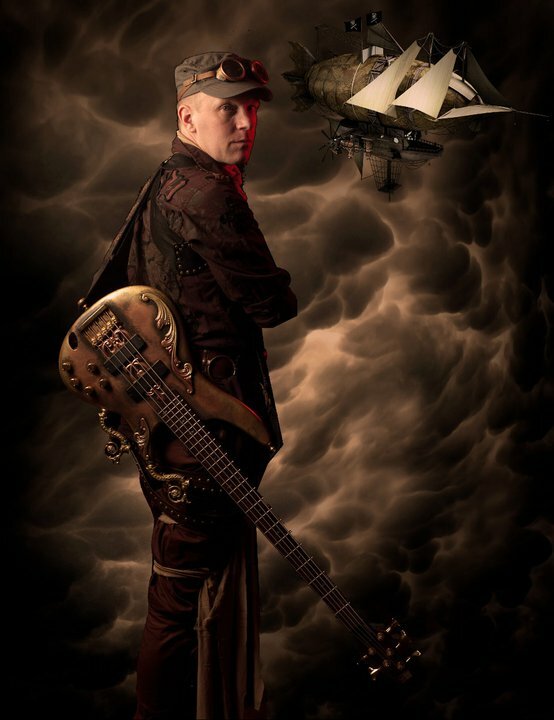 Steampunk is the style of the creative and as such almost everything in these pictures has either been made from scratch by the band themselves or bought and altered. 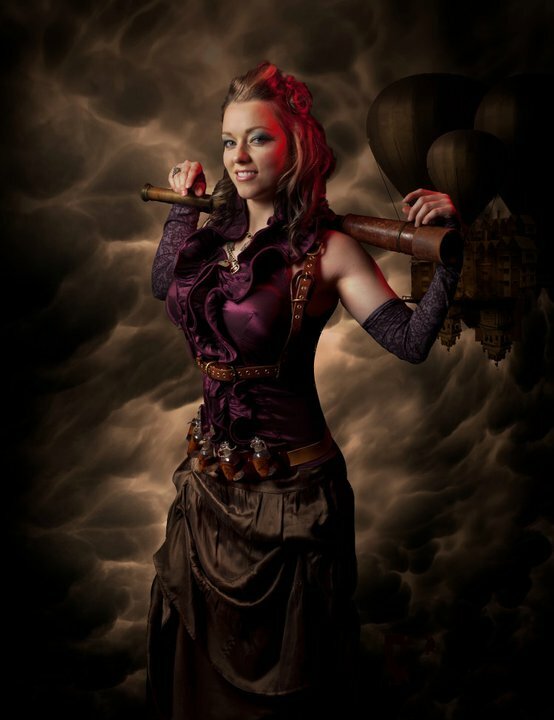 All you need is imagination and will power when it comes to Steampunk. They have barrels of both. Their community is ever-growing, they have very active Facebook and Myspace accounts and all their music so far can be found on Itunes. Their website is also a great port of call for those of you that want to find out more! If everyone dressed like this the world would be a better place… visually at least! It is heartwarming to see a band so immersed their own lore. They are a force of musical nature. Live they are superb; they care a huge amount about their fans and happily hang out before and after gigs. Personally I have never felt so appreciated for appreciating good music! I have yet to find a song of theirs I don’t like, and I have over a dozen that I completely Love. I’m surprised I’ve been able to keep it as brief as I have! There is so much more I could say, but the rest is yours to discover. They are, as you may have guessed, my favorite band. 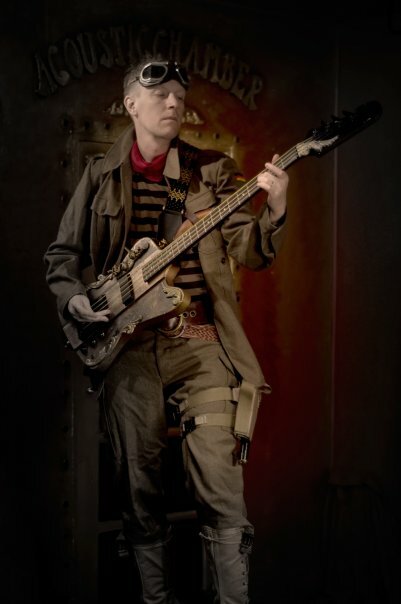 And although some may disagree I think of Abney Park as being the forefront in music and style when it comes to the genre of Stemapunk. But more importantly they are making music that they want to make, and they are designing, making, and wearing clothes that matches their music perfectly. They are a band that lives what they do, and loves what they create. And for that reason they have my respect, and my almost crazy level of fandom. Anywhere But Here, the second offering from Ben Steed and the Orchestra of Symmetry continues where the last album finished. There are marked improvements, whilst retaining many of the features which made the last album what it was. A greater confidence is evident; the opening track “Anywhere But Here (Part 1)” jumps straight into a relatively fast paced melody, something that was lacking in Distorted Skies. Whilst the vocals seem far more at ease within the songs, showcasing both the growing talents that Ben Steed has both as a vocalist and as an all-round maker/mixer/ creator of music. The frequent use of vocals, in comparison to his last offering, gives his sound far more of a purpose. “Anywhere But Here” puts forward songs that are catchy, well-balanced, and that have not lost any of the skill exhibited in the previous album. It is important to remember however that it is not Ben Steed’s way to instantly please his fans but rather to allow the music he creates grow of its own accord; constantly developing and rewarding the listener for his or her perseverance. ‘Anywhere But Here’ builds on this pattern by separating vocal heavy tracks from melody centred tracks. In the separation lies the albums strength: by the division both styles have become far better. Ben Steed is well on his way to realising his sound. At a track count of 14 it is a big album, with big ideas. Perhaps some will find this hard to get to grips with and for that reason not listen to every track from start to finish. Fortunately there are enough stand out tracks to make this okay: ‘The Town of Many Faces’, ‘A Sight to be Seen’, ‘Centre of the Earth’, ‘Something in the Air’, and ‘Mariana’ being among my personal favourites. And whilst there are a few forgettable tracks on the album such as ‘Folie a Deux’, and ‘Lullaby’, there is no denying Ben Steeds creativity. Distorted Skies, the first album released by Ben Steed, is difficult to define. It is at once easy to listen to whilst at the same time difficult to truly comprehend. It is something very new and captivating in a music world dominated by company built bands. Each song is individual and above all surprising, Ben Steed does the unexpected within his sound and it is this that in my opinion will build him quite the fan-base. I shall do this review song by song as I feel each song deserves to be explored. Time Will Erode Us (I’ll Be Waiting) – The album’s opening song creeps up on you with a slow build that begins to pulse slowly. I expected the build to get higher and eventually explode with noise (a technique used so often these days, and for good reason) but instead it reaches a level volume and continues until it is joined by soft breathing and the words: ‘I knew it was you’. Slow piano joins the gentle reverberating song and it continues… I will not explain each song bit by bit but I feel it was important to explain how this fairly slow and non flashy song becomes so much more than you would initially think. There are very few lyrics making the words that are there so much more meaningful and indeed haunting, haunting being perhaps the key word to describe this song and the album as a whole. The Conspirator – So after a seemingly minimalist song you’re expecting more of the same right? I was, and I’m happy to say I was wrong. The Conspirator is more upbeat and consistent in its rhythm, and it is further strengthened by the appearance of vocals which are both mournful and sinister. The instrumental element takes a back step on the whole and gives way for vocals which echo through the song giving it form and drive without speeding up the tempo. It is one of the albums best songs in my opinion with my only criticism being that the beat can be too consistent, but this is a minor matter that only becomes an issue when you’ve had it on repeat for a whole day… as I said, one of my favourite songs on here. Blood and Stone – Following the previous songs preference for lyrics Blood and Stone is very lyrically led. Although the instrumental side is far deeper than the last two tracks. The theme is deeply sinister focusing on plots of revenge but not to the extent that one would class as ‘cheesy’. It avoids this in the fluidity of the vocals which have a certain mesmerizing quality. Such is its composition that the ensemble stalks along until the vocal relinquished its hold on the song leaving the haunting melody to continue until it to fades into a poignant piano segment that finishes Blood and Stone perfectly. Digital Desert – At 8:07 it is a hefty song. But it introduces us to a far more computerized sound, as its title suggests, and in doing so yet again shows us that it would be wrong to make assumptions about where Ben Steed’s songs will go. It is a song of protest against the modern era: ‘Micro chips in every gland’, and initially the vocals have dominance but it leaves the song in such a way that you may not notice. My fault with this song is it can feel too long, especially to those who favour lyrics to drive a song. And indeed given the subject matter I expected, no, desired the vocals to return after a time of musical interlude but they did not. Episodes – Okay talk about being knocked off guard: Episodes veers wildly in a different direction to any of the other track. It has a certain special place in my heart for the following reason: I almost skipped it. I was admittedly put off by the intro but fortunately I kept listening. The track becomes something quite different; it builds up layer by layer gaining depth and complexity until it is possessed by some of the most heart wrenching moans I have ever heard. Like some kind of tormented ghost it makes the song its own and marks this as one of the most interesting and surprising tracks on the album. Divide the River – Deceptively simple in beat Divide the River is in equal parts delicate, soulful and sad. The vocals are short-lived but effective whispering: ‘There is nothing left for us’, in such a way that can be heard as a protective warning or a subtle threat. But on the whole what this track does is take a mellow route that serves to lure the listener into a safe sense of security even throwing in a Spanish like guitar part to great effect. Splitting Clouds – After such a chill-out track would you expect to be greeted with the slowly building roar of engines? Neither was I! But expect the unexpected [which should be this albums motto btw]. This is a sort of lullaby however, and soon after the take off we are met with a twinkling yet not overly delicate sound that intermingled with several others to create something quite unique. The name of the song will make sense to those of you who have ever dreamed of flying [preferably in an airship] straight up into the sky. Abandon Ship – For all the uplifting the previous song does Abandon Ship goes in quite the opposite way. It emanates with a resigned sorrow both vocally and instrumentally. In my opinion it shows Ben Steed at his very best: the balance between vocals and instruments is perfect, the tempo is slow but not so that you lose interest, the vocals are cleverly done and heartfelt and the slight variations in background music as the song develops makes it one of the album’s strongest tracks. Misanthropic social butterfly – Easily the saddest song on the album. Undoubtedly depressing but with such composition that it doesn’t succumb to sounding whiney. Violin and piano intertwined with hushed vocals guide us through the final track of Distorted Skies to its slow and elegant ending which left me feeling emotionally drained and yet strangely hopeful about life. An important point to make about this album: it is an experience. And as such it must be personally and closely listened to before you can really get to grips with it. Admittedly it will not be for everyone and perhaps some faster tracks wouldn’t go amiss but on the whole it is a deeply fascinating album with some truly innovative tracks that has truly impressed me. Electronica, Experimental and Techno bands are become more and more cliché and over produced. That is this reviewer’s opinion. Even the more alternative bands such as Celldweller are becoming far too polished to the point of losing all sense of experimentation. With that in mind let’s take a listen to the debut album of the one man band known as `The 12th Hellion’. What first struck me about this eleven track album is how stripped down it is. The sound is clear and consistent without being becoming dull, it is intriguing without being over complicated and it is retro whilst remaining fairly fresh. To all those who remember Double Dragon, Street Fighter, Mortal Kombat, and all those other classic fighting games this album may bring a tear of nostalgia to your eye. To say it sounds like a game soundtrack seems almost derogatory but I say it with utmost sincerity. It is an album that makes me scream “BOSS FIGHT!! !” or “ROUND TWO… FIGHT!” inside my skull without it becoming cheesy and it makes me want reconnect every classic games console I own! Not that this is entirely game orientated, in fact this connection may have been made completely by accident on the creator’s part, although I doubt it. At some points it puts me in mind of 80’s electro and at others more recent bands such as Prodigy whilst keeping its own particular brand of arcade uniqueness. But above all it is FUN! Not to the point of silly and certainly never to the point of self mockery but fun in the way that it feels uplifting whilst not being too happy and feels `cool’ without being too strait faced. To put it bluntly it brings back that childlike feeling kickassery! It is music to wield a pixellated blade to and no mistake! (very relevant `Scott Pilgrim Vs The World’ reference). So all in all an upbeat old school album of badassery (and other words ending in ‘ery’). But it is not without its flaws. The songs can drag and repeat a bit making them lose their edge, if only slightly. And its retro leanings deny it any modern grit, but perhaps this is its main charm. Is it an album to own? I would say yes. It’s inexpensive, catchy, ambient, atmospheric and fun all at the same time and above all it is a fresh sound from an independent artist. So go have a listen on his myspace and see what you like, buy some tracks from amazon, or the whole album! In today’s world of passive listening it could be just what you need to turn that commute into work or school just that little bit awesome.